Equator Navigation has over 40 years experience in marine services including marine parts supply, servicing and tanker conversion. 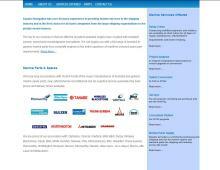 Equator Navigation is a major marine spares suppliers providing marine parts from all of the major manufacturers including marine engine parts, marine pumps and marine air compressors. Marine parts are sourced worldwide and can be supplied new, refurbished or re-conditioned. Equator Navigation have a good association with: Daihatsu, Yanmar, Wartsila, MAN B&W, Sulzer, Mirrlees Blackstone, Deutz, MAK, MWM, Heishin, Naniwa, TKK, Shinkokinzoku, IMO, Allweiller, Thune Eureka, Hamworthy, Worthington Simpson, Merser, Hamworthy, Tanabe, Atlas Cpco, Jos.L.Meyer, Sperre, Alfa Laval and Mitsubishi. Equator Navigation also have a Riding Crew of certified engineers and welders who can provide on board maintenance and service of all marine engines, repair marine pumps, replace air compressors and much more. Contact Equator Navigation for quality new, refurbished and re-conditioned marine parts and repairs.